Here is another way of doing scheduling that is sort of like Agenda's way of doing it. It involves Python scripts and Attributes. This way has the advantage of collecting items from within many different topics. 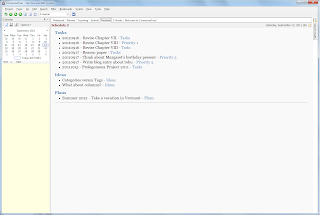 So you could put items like this "[[task:=20110924 - Revise Chapter VII]]" into any topic and have them appear on your Scheduling pages. This relies on a slightly tweaked script written by Rob Hughes (available here. It was meant for a GTD application but can be used for many other purposes. Here you have just two columns, namely the name of the attribute and the link to the topic in which the attribute is found. You can get creative by naming your attributes to reflect what would be in other columns, if you used the previous solution. 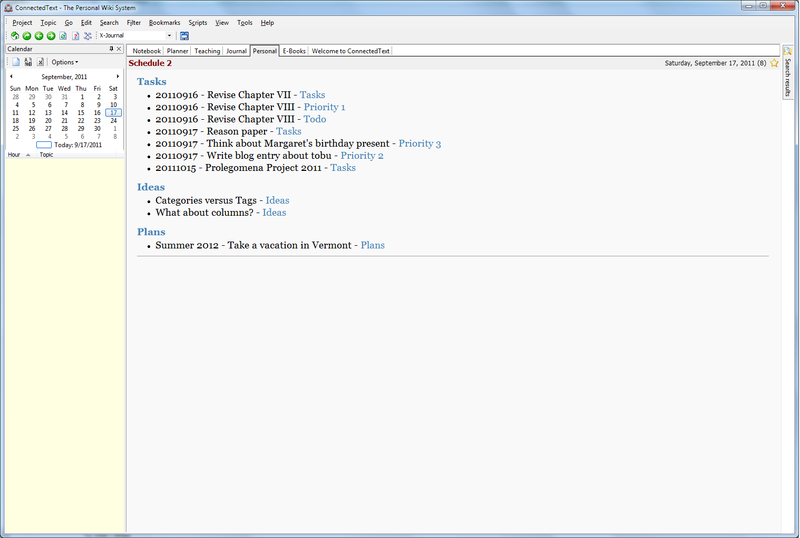 You can also enter your your items into topics that are named to reflect their priority or their project. And finally, you could just put the additional information with the items (attributes) into the topic that contains them. that is the beauty of links that they take you with one link to the referring page. In any case, I hope to have shown that there are more ways than just one to reproduce Agenda-like behavior in ConnectedText. If I were a programmer and not just a hacker, I could probably vastly improve on this capability. 1. Needless to say that I use AutohotKey to abbreviate stuff like this.